Hilgenberg came from a stellar football pedigree (Uncle Wally played linebacker for the Minnesota Vikings) but still went undrafted in 1981. 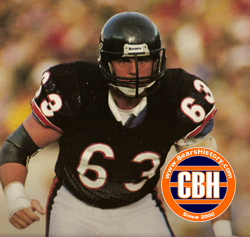 For the Bears, he would play on special teams and wait patiently behind veteran Dan Neal for his first three seasons, but midway through the 1983 season he took over as starter at center and didn't look back. Hilgenberg earned his first Pro Bowl berth in 1985 and would play the position in that game for the NFC for seven straight seasons. His presence on the Bears' line was a given as he missed just two starts during those years. During training camp in 1992, he noted how much more money the Bears were paying 1991 top draft choice (and bust) Stan Thomas, and he held out for more money. This infuriated Bears team President Michael McCaskey, and in August of that year a Bears legend was traded to the Cleveland Browns. "Hilgy" would play two more years for the Browns and New Orleans Saints before retiring following the 1993 season. Hilgenberg is often mentioned as a potential inductee to the Pro Football Hall of Fame.